I've been quite happy with my Formotion clock, so I expected great things of Formotion's thermometer. While (like the clock) the thermometer is beautifully machined and finished, durable and waterproof, it's also largely useless. I ordered the stick-on 1.5" liquid-filled unit in black alloy to match my clock -- Formotion no longer sells directly so I had to buy from Amazon. The first meter arrived with its fluid escaped. After several attempts to contact Formotion thru Amazon's website I contacted Formotion directly, which timely sent a replacement unit. Using 3M Dual-Loc, I stuck the thermometer tn a horizontal fairing support in front of the steering head on my ZR-7S, a location which is out of direct sunlight but influenced a bit by engine heat while stopped. I several times compared it's temperature readings in the garage (cold engine) to readings on a nearby electronic Teltek Informer II unit (review soon to be posted) and they were very close. However, over the course of a couple of thousand road miles, it's obvious that the Formotion thermometer simply doesn't respond to temperature changes quickly enough to be useful. I say "quickly enough" but the truth is the meter doesn't respond much at all -- particularly on the downswing. 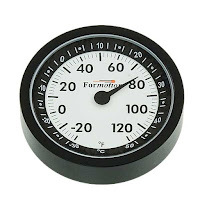 I realize many motorcyclists don't see the point of on-bike thermometers, but for folks like me who like to know the ambient temp (either as an ice-watching aid or to record highs and lows), a thermometer must be fast-responding. The unit read 52 degrees when I put it into a zero-degree F freezer: after 10 minutes it still read 52; after 2 hours it read 48 and after over 12 hours later it was 42. That's slower than, well...molasses in January. Do yourself and your wallet a favor and pass on Formotion's thermometer.